This years student award goes to twelve year old Amelie Lucie Boggaert and has been kindly sponsored by Dr. Manfred B. Vogt and his wife Marion G. Winter. Marion, an artist herself is passionately involved in Miniature Art and with her husband sponsors a couple of art shows around the world. When they saw the potential in Amelie, they contacted Martina to sponsor art lessons for her, which they have done since. Amelie has attended our arts training since February 2016. 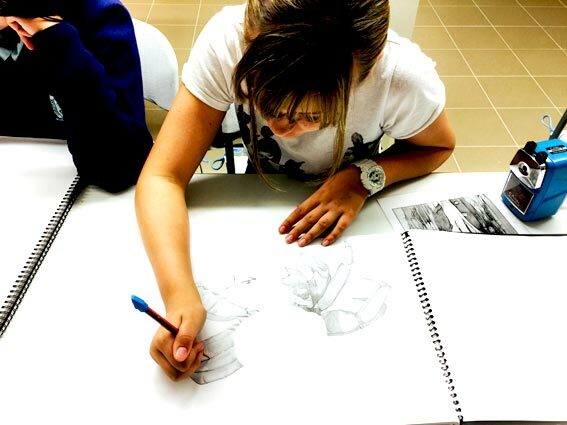 She has since greatly improved her drawing and painting skills and creates work with great enthusiasm, concentration and ease these days. We are looking forward to see what Amelie will unfold creatively this year. Along with reading Amelie spends almost all of her time over a sketch pad listening to music. Her mum even goes so far as to say that her room smells of "pencils and books". But she always finds time to share with her beautiful dog Nitro. Amelie hopes to write her own books in the future and be able to illustrate her written work. She shared with us that Martina is her favourite art teacher which is the greatest compliment a teacher ever can be given. We found that Amelie displays a maturity that is rare for her age. She does not only understand a lot, but is actually interested to listen and learn. Amelie also speaks a very clear and vibrant English for her age. Sadly just recently most of her work was stolen from her car including a new set of coloured pencils worth over $500, which her mum brought her as a gift, just weeks before. We would love to show more of her work here, but unfortunately we will have to wait a little. It was heartbreaking to see all her work just taken like this. But as Amelie draws all the time, so we will soon see some new exciting works.